Scales Seafood & Steaks is a new and different seafood and steak restaurant located on Fisherman’s Wharf. Scales Seafood & Steaks offers entirely new views and a new experience. Scales Seafood & Steaks features fresh seafood, steaks and pasta; however, with its magnificent lounge, guests can also indulge in an exotic cocktail or a fine wine from the extensive wine cellar while enjoying the harbor and bay views. Scales Seafood & Steaks is a perfect location for your next event or party. 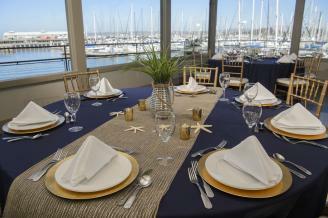 With our combination of amazing food, award winning wines, creative specialty cocktails, and a breathtaking view of the harbor and bay, we offers a distinctly memorable experience for your next event. If you are planning an event for a group of 10 – 130, please let us help you create an event that no one will soon forget. At Scales Seafood & Steaks, we are committed to providing you with the highest level of service and hospitality, and will customize our offerings to meet your unique requirements. Call us at (831) 375-1331 and ask for an event specialist, who can assist you with all of your questions and help you plan the perfect event. Flash Your Badge and receive a Complimentary Appetizer!